지금, 국제 사회에서 유가를 전망하는 사람들 중에는 향후 1~2년 내에 공급 제한 등으로 유가가 배럴당 $100 달러 수준을 넘어선다고 전망하는 측과 유가가 “더욱 낮은 수준에서 더 오래 지속될 것(lower, longer)” 이라고 전망하는 사람들로 나뉜다. 확률적으로 따져 보자면, 일부 석유 공급 국가들, 특히, Iran이나 Venezuela 뿐만이 아니라 Libya나 Nigeria 등 국가에서 일어나고 있는 현상들을 감안해 보면, 양 측의 전망이 모두 가능성이 있다. 이들 나라들은 모두 나름대로 다양한 정치적인 곤란을 겪고 있고, 경우에 따라서 일부 나라들은 생산이 회복될 것으로 보이는가 하면, 다른 나라들은 오히려 생산이 위축될 것으로 보이기도 한다. 그러나, 이런 전망들은 다른 한편으로, 지속적으로 이어져 내려오는 분석 상의 문제들을 반영하기도 하는 것이다. 이는 너무나도 많은 사람들이 시장 경제에 대해 단지 피상적인 지식만을 가지고 있는 데에서 나오는 문제이다. 이러한 문제는 과거에 유가가 배럴당 $100 수준을 넘어섰을 때, 많은 기업 경영층 인사들이 원유 생산의 배럴당 한계 생산 비용이 $100 이기 때문에 유가가 오랜 동안 그 수준 아래로 내려가지 않을 것이라고 주장했을 때에 분명하게 나타났던 적이 있다. 이러한 전망은 한 마디로 말하자면 초점이 잘못 맞춰진 틀린 전망인 것이다: 유가가 낮다는 것은 비용이 많이 소요되는 프로젝트는 포기하게 될 것이라는 점을 의미하는 것일 수도 있다. 그러면 분명히 한계 비용은 내려갈 것이고, 또한, 투자가 감소하여 심각하게 부풀려졌던 생산 비용은 감소할 것이다. 시장 애널리스트들은, 석유 시장이건, 농산물 시장이건, 부동산 시장이건, 일시적으로 가격이 상승하게 되면 그런 높은 수준의 가격이 영원히 갈 것이라고 잘못 해석하기가 쉬운 법이다. 예를 들어, 천연 광물이나 석유의 가격은 가장 저렴한 자원이 채굴되어 감에 따라서 점차 자연적으로 상승할 것이라고 믿기 쉽다. 그렇다고 해서, 일시적인 요인들이나 정책적인 선택 등의 영향으로 가격이 장기적인 추세 이상으로 상승할 수 없다고 말하는 것은 아니다. 2003년 이후 석유 공급에 관련한 정치적인 혼란이 일어났던 Venezuela, Iraq, Libya, Iran, Nigeria, Syria, Yemen 그리고 South Sudan 등의 예를 보면, 많은 경우에 원유 생산량이 하루 300만 배럴 규모로 추가로 감축된 것이다. 이러한 요인들은 소위 “값 싼 석유”의 고갈에 더해 지난 15년 동안 유가를 상승시키는 가장 주요한 요인이 되었다. 지금도 여전히, 이러한 부정적인 영향을 미치는 지정학적인 상황 변동 요인을 제외하더라도, 석유 산업에 대한 신규 개발 투자(upstream investment) 부족 현상으로 시장에 석유 공급이 긴축될 것이라는 우려는 남아있는 것이다. 시장의 일부 관측자들은 이미 2014년 유가 폭락 사태로 인해 하루 300만 배럴 규모의 계획되어 있던 개발 프로젝트들이 연기되거나 취소되었다고 주장해 왔다; 국제에너지협회(IEA)는 지난 2014년에서 2016년 기간에 신규 개발 투자는 절반으로 줄었고, 아직도 최고 정점 시기에 비해 1/3 정도가 낮은 수준이라고 지적했다. 석유 산업에 대해서는, 실제로 명확하게 증명하기가 쉬운 일은 아니라고는 해도, 이러한 우려는 항상 존재해 왔다. 이러한 우려는 부분적으로, 시장 예측자들 사이에 있는 석유 공급에 대해 보수적으로 보는 견해들을 반영하는 것이다; 즉, 그들은 ‘확실하게 눈에 보이는 것들’ 이외의 상황 발전들은 좀처럼 예상하려고 하지 않는 것이다. 그들은 천연 자원의 발견은 특정해서 예측할 수 있는 것이 아니어서, 장래에 무엇이 얼마나 일어날 수도 있다는 가정(假定)을 해서는 안된다는 신념을 가지고 있는 것이다. 이러한 관념에 따르자면, 석유 가격 붕락이 일어난 뒤가 아니면, 태생적으로 석유 공급을 과도하게 낮게 예측하는 경향이 있는 것이다. 신규 석유 공급량은, 대규모 공급 증대가 일거에 일어나는 것이 아니라, 대부분의 경우에는, 특정 기존에 개발된 유전(油田)에서 상대적으로 소규모 시추 작업의 결과에 따라 증가하는 것이다. 따라서, 신규 개발 투자가 낮다는 것은 기존의 유전에서의 생산량이 종전보다 더욱 빠르게 감소할 것이라는 것을 의미하는 것이고, 반대로, 신규 개발 투자가 높아지면 기존 유전에서의 생산량이 떨어질 것을 의미하는 것이다. 결국, 순수한 공급량의 변동은 커질 것이다. IEA가 기존 유전에서 감소율을 추정한 결과, 작년에 이 감소율이 하락한 것으로 확신한다. 2010년~2016년 기간 중 7%였던 것이 2017년에 5.7%로 하락했다고 추정하고 있는 것이다. 이 추산에 따르면, 연간 약 日産 600tb/d 규모의 純 공급 증가를 의미한다. 그리고, 일부에서, 페름(Permian) 지역의 유전 및 서부 캐나다 지역 석유 사막에서의 원유 생산이 병목(bottleneck) 현상에 직면해 있다는 우려가 있어서 일부 생산자들이 두 자리 숫자의 가격 할인 고통을 겪기도 했으나, 이러한 원인으로 장기적으로 공급이 감소될 것이라는 주장은 결국 잘못된 것으로 드러났다. 페름 지역 유전의 pipeline 용량은 증강되고 있고, 서부 캐나다 생산자들도 철도 수송에 힘입어 원유 공급을 꾸준히 늘려와 지금은 기록적인 수준에 도달하고 있다. 아래 도표는 IEA가 非OPEC 생산국들의 생산량에 대해, 2013년~2018년 동안의 실제 생산량 증가에 기반한 5년 단위 중기 생산량 증가량을 日産 100만 배럴 당위로 예상한 것이다. 여기에서 나타나는 것처럼, 확실히, IEA의 예측이, Canada, Russia 및 미국 등의 생산량에 대한 예측은 아주 과도하게 비관적인 반면, 멕시코에 대한 예상에서는 약간 과도하게 낙관적인 것으로 나타나고 있다. 한편, 수요 측면에서는 유가 동향에 대한 증거를 충분히 제공하지 못하는 것으로 보인다. 지난 10년 동안에 많은 국가들이 재정 수단을 동원하여 경기 촉진 정책을 펼쳐 왔으나, 작년 말에 단행한 미국의 대규모 감세 정책도 마찬가지로, 글로벌 경기는 하강할 가능성이 없지 않아 있는 것으로 보인다(‘more likely than not’). 아주 흥미로운 점은, IEA는, 최근 몇 해 동안 예상해 오던 추세와 별반 다르지 않게, 전세계적으로 하루 100만 배럴 정도의 완만한 (수요) 증가를 예상하고 있다. 그리고, 이러한 예상치는 항상 과도하게 낮게 예상해 왔던 것으로 드러났던 것이다. 특히, 非 OECD 국가들의 실제 수요는, 부분적으로 데이터의 質 문제로, 예상을 항상 초과해 왔고, 따라서, 상향 수정하는 것이 일상적인 일이 되고 있다. 그렇다고는 해도, OPEC 석유에 대한 수요가 증가하지 않을 가능성, 심지어 경기 침체에 따라 수요가 감소할 것이라는 가능성은, 석유 공급에 대한 비관적인 견해보다 더욱 현실감이 있게 받아들여야 할 것이다. 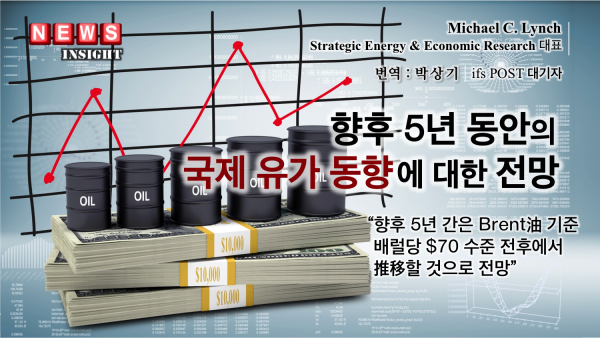 아래에 있는 도표에서는 IEA가 연도별로 OPEC 석유에 대한 5년 동안의 연간 수요 변동을 예측한 것이다. 이를 보면 예측치는 지속적으로 실제치보다 과도하게 높게 예측되어 있는 것이다. 여기서 현재의 석유 시장의 긴축 상황으로 돌아가 보자. 베네수엘라의 석유 생산 붕괴는 지난 해에 약 日産 100만 배럴 조금 넘는 정도의 생산 감소를 가져왔고 이는 앞으로도 지속될 것으로 전망된다. 그러나, 이 감소분의 대부분은 이미 사우디 아라비아 혹은 러시아 등 다른 나라들의 생산 증가로 상쇄되었고, 올해 말 이후로는 더 이상의 많은 증산은 기대하기 어려울 것으로 전망된다. 사실, 베네수엘라의 新 정권은 생산 시설의 적당한 유지 보수나 수리만 하면 공급의 상당량을 회복할 수 있으나, 이것이 언제 이루어질 수 있을지는 예견하기 어려운 상황이다. 언제나 그런 것처럼, 다른 여러 나라에서 석유 공급에 지금보다 많은 문제가 발생할 위협은 상존하는 것이다. 그러나, 이미 오랜 동안에 걸쳐 광범한 생산 차질(disruption)을 겪어 온 터이라서, 향후 5년 동안 이런 난관들은 대체적으로 완화될 것으로 보인다. 유가의 폭등 혹은 급락(price spikes and crashes) 가능성은 여전히 존재하나, 전반적으로 시장 ‘공급은 적절할 것(well-supplied)’으로 전망된다. There is a split between those who expect the oil price to go over $100 a barrel within a year or two due to supply restrictions and others who are predicting “lower, longer” prices. Odd as it might seem, both are possible depending primarily on what happens in certain oil producers, especially Iran and Venezuela, but also Libya and Nigeria. All these countries are suffering from political problems of different sorts, and each could see either a recovery in production or further disruptions. But this also reflects an ongoing analytical problem, where all too many have only a superficial knowledge of the market economics. This was made obvious when the price of oil was over $100 a barrel and many executives argued that the marginal cost of production was $100, so that the price could not be below that for any length of time. Such is simply untrue: lower prices would mean expensive projects would be abandoned, reducing the apparent marginal cost, and lower investment would reduce upstream costs, which had been seriously inflated. Which isn’t to say that transient factors and policy choices can’t elevate prices far above the long-term norms. Since 2003, political disruptions of oil supply have occurred in Venezuela, Iraq, Libya, Iran, Nigeria, Syria, Yemen and South Sudan, often adding up to 3 mb/d of lost production. These, more than the depletion of the so-called “easy oil” have been the primary factor in higher prices over the past decade and a half. Still, there is concern that the shortcoming in upstream investment will reduce oil supply enough to tighten the market, even without negative geopolitical developments. Several market watchers have argued that 3 mb/d of planned projects have been cancelled or delayed by the 2014 price collapse; the IEA has noted that upstream investment has dropped by about one half from 2014 to 2016, and is still about 1/3 lower than the peak level. The industry has often had such fears, although they have rarely proved out. In part, this reflects a conservatism about supply amongst forecasters: they are reluctant to predict any developments which are not visible, hewing to the concept that discoveries can’t be specifically predicted and so should not be assumed to occur. This results in predictions of supply that are too inherently low, except after a price collapse. New supply does not just occur in large increments, but often in relatively small-scale drilling especially in existing fields. Low levels of upstream investment does mean that these fields’ production will decline more quickly, higher investment and the decline will slow, meaning net supply change will be higher. The IEA estimates decline rates in existing fields, and believes that the rate has slowed in the past year, from 7% in 2010-2014 to 5.7% in 2017, meaning a net supply gain of about 600 tb/d per year. And while there have been concerns about bottlenecks in both the Permian oil field and Western Canada oil sands operations, causing some operators to suffer from double-digit price discounts, the argument that this will curtail supply over the long term appears misplaced. Pipeline capacity in the Permian is growing and Canadian producers, relying on rail shipments for now, have continued to increase production to record levels. The figure below shows the annual growth rate for non-OPEC supply predicted in each of the IEA’s past five medium-term outlook with the actual growth, compared to the actual rate from 2013-2018 in million barrels per day. Clearly, the current IEA forecast appears to be much too pessimistic about supply from Canada, Russia and the U.S., while slightly too optimistic about Mexican supply. The demand side is unlikely to provide much support for prices. After nearly a decade of fiscal stimulus in many economies, not least last year’s tax cut in the U.S., it seems that a slowdown is more likely than not. Interestingly, the IEA projects slow growth of just over 1 mb/d globally, not different from the forecast trend in previous years—which repeatedly proved too low. Non-OECD demand especially tends to outperform expectations, due in part to the lower quality of data. Upward revisions are common. Even so, the possibility that demand for OPEC will not increase, and could even decrease with a recession, must be considered more likely than the pessimistic view of supply. The figure below shows the IEA’s projections of the annual change in demand for OPEC oil in the five-year forecasts, and they have consistently been too high. Which brings us back to the current market tightness. The collapse in Venezuelan production has taken roughly 1 mb/d off the market in the past year and should continue, while new U.S. sanctions against Iran could remove a further 1 mb/d or more of supply. However, most of this has already been offset by increases from Saudi Arabia, Russia and others and appear unlikely to increase much beyond the end of this year. Indeed, a new government in Venezuela could easily restore significant amounts of supply with moderate amounts of maintenance and repair, although when that will occur is hard to say. There remains, as always, the threat of further supply problems in a variety of countries but after a prolonged period of widespread disruptions, these should ease over the next five years—on average. Price spikes (and crashes) are still likely but overall, the market should be well-supplied. Prices for Brent should average around $70/barrel, with changes in production from Iran and Venezuela especially moving them up or down accordingly. If U.S shale continues to grow at recent rapid rates, it is possible that OPEC (or at least the Saudis) will decide that the equilibrium price is below that level.